Start On Highway 49, 1.1 miles west of Yuba Pass. 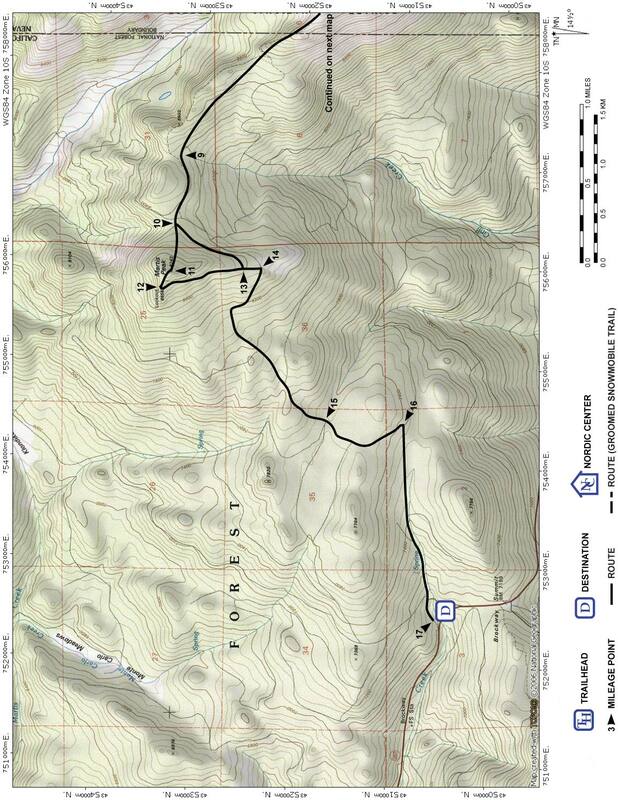 The Beartrap Meadow Loop is one of numerous tours that can be created from the roads and marked ski routes on the north side of Highway 49 near Yuba Pass. It combines parts of the Three Knobs and the Lunch Creek tours. The resulting tour takes you to the high point of the Three Knobs tour, retains one section that requires careful navigation, but eliminates the steepest section of that tour. The loop also retains miles of roads from the Lunch Creek tour including those paralleling Beartrap Meadow. The resulting difficulty is less than the Three Knobs tour, but greater than the Lunch Creek tour. The terrain on this tour is predominantly gently sloping roads and caters to skiers who enjoy kicking and gliding mile after mile. But you do leave the security of the roads, climb onto a broad ridge and then navigate without good landmarks for a short distance. Although there are groomed snowmobile trails in the area, this tour offers good solitude. Of the 8.0 miles, only 1.6 miles of the tour coincide with snowmobile routes and the remaining 6.4 miles are in areas closed to snowmobile use. In particular, you will find yourself quite alone at the high point on a broad ridge. Unfortunately, at the time of the writing of this tour description many of the blue diamond markers have fallen from trees and the paint has peeled from signs. Regardless, the description given here can be used to successfully follow the route. You can retrace your path if at some point you cannot find the route forward. From the trailhead (10) ski north on the snow-covered road for 200 feet until you reach a fork in the road (11). The Three Knobs tour continues north (straight) on the lesser road while the Beartrap Meadow Loop tour makes a sharp turn to the west (left) and continues on the large road. Turn west (left) and follow the large road generally north for 1.6 miles until you reach a road junction (9). The junction is located at a high point, but the high point is large and very flat so it is not obvious. Also the junction itself is not obvious. Look for the sign in the tree on the west (left) side of the road indicating where the Three Knobs route leaves the main road. Turn right off the main road onto a lesser road and ski north for 0.6 mile until you reach a road junction (27). Continue on the road that makes a 180 degree turn to the right, then a sharp turn to the left, and finally continue skiing east on the snow-covered road for a total of 0.6 mile until the large road you are on disappears (26). Between the two turns and for 0.1 mile after the left turn the road may be difficult to discern, but beyond it is well defined. Climb slightly north of east up what may appear to be a very small road for 0.1 mile until you reach the very broad ridgetop and the southwest side of a small knob (25). This is the beginning of the section of route that takes careful navigation. Ski around the north side of the nearby knob for a total of 0.2 mile until you intersect a snow-covered road (22). Do not be tempted to ascend the shallow saddle to the east of the knob; you need to ski a little farther east before heading slightly south to intersect the road. Many of the blue diamonds have fallen off trees in this section making the marked route difficult to follow. 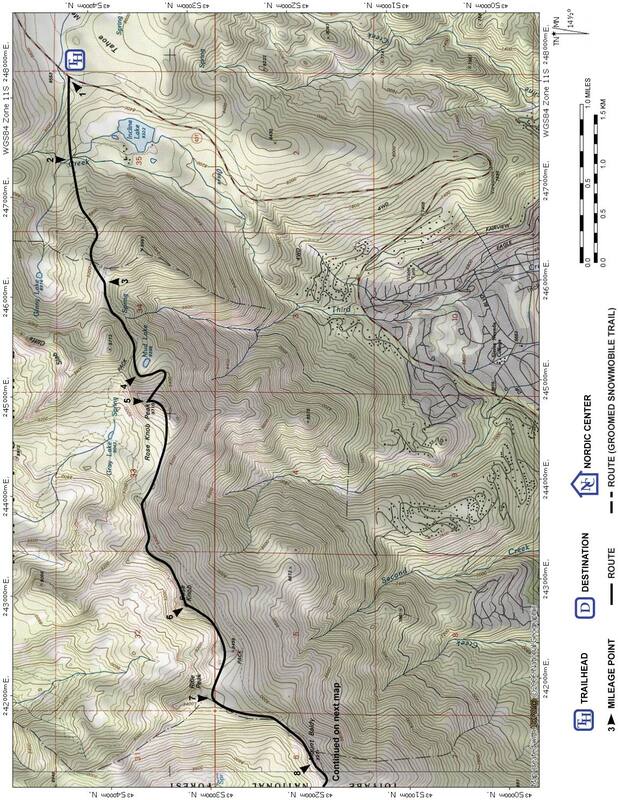 Waypoints 23 and 24 are provided for additional help in navigating with a GPS. Ski east (left) on the snow-covered road for 0.3 mile until you reach a road junction and a groomed snowmobile trail (21). Approximately 200 feet before reaching the road junction the Three Knobs tour turns off the road and heads south. The signs at this point are unreadable because the paint has peeled. Turn north (left) and follow the snowmobile trail for 0.2 mile until you reach a road junction (6). Continue generally south on the road, at first descending and then climbing, for 0.6 mile until you reach the high point (9) that you were at previously. Continue generally south on the major road for 1.6 miles until you reach a road junction (11) and then turn south (right) and ski 200 feet until you reach Highway 49 (10).